I don’t subscribe to conspiracy theories and there are several reasons why: It’s too easy to manipulate evidence and tamper with videos, it’s too easy to keep asking experts until you find one who says what you want to hear, and it’s too easy for different people to interpret the same things in different ways if they feel they have a reason to do so (even our own crystal clear memories are completely unreliable as many studies have proved). O.J. Simpson was found not guilty so I rest my case. Add to this the fact that every government has a powerful and well-funded opposition trying to discredit it and you’ll see why I find it hard to believe anything I read, especially about 9/11. If you Google “9/11 conspiracy” you will find endless lists of facts and figures and you will find all kinds of video and documentary evidence to support the idea that the US government was involved in the attacks for its own complicated and sinister reasons. Maybe it was. Maybe it wasn’t. I don’t know. There are far more powerful, far smarter people than I involved on both sides of the argument so I will never get to the bottom of it by listening to them, especially not after more than 17 years have passed. In any event I tend to agree with the last convincingly-written thing I read so I prefer to rely on my own common sense when I question these things. BUILDING COLLAPSES: How is it possible that both World Trade Center towers came straight down in the most convenient way possible causing minimum damage to other buildings in the area, and why did Building No. 7 collapse at all? I realise they were known as the “Twin Towers”, but how is it possible that BOTH buildings did the City of New York such a huge favour and came straight down after being hit by one plane each? One was a miracle. Building No. 7 was never hit by a plane but caught fire somehow, and the fire became so intense that the building collapsed entirely. If it did, it was not built to code and the architect should be in jail. 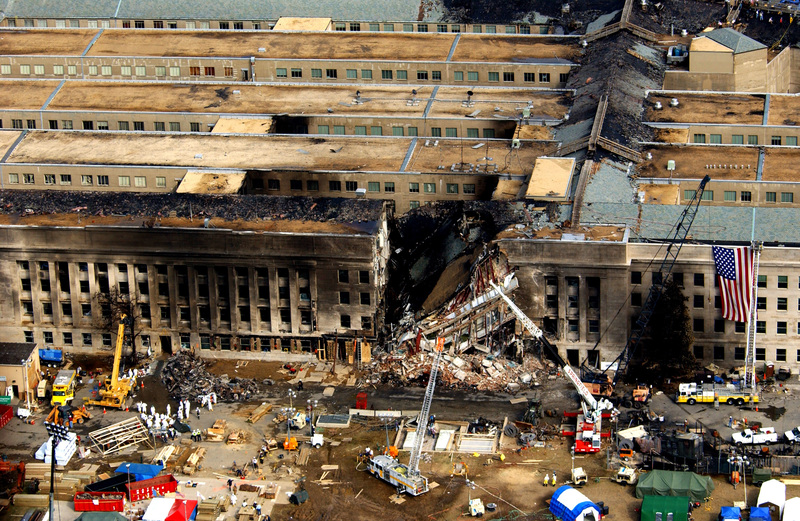 THE PENTAGON: Take a look at the picture attached to this article taken in the aftermath of the incident. Isn’t there something missing? Like an aeroplane for example? Where is the debris? How come not a single piece of the plane or its contents is visible? If we accept that the circular fuselage of the plane made the neat square hole in the building, where did the wings impact the building and what damage did they do? And why is the fire damage so slight when the plane must have had thousands of gallons of aviation fuel on board at the time of the crash? THE CLASSROOM SCENE: There is well-known video footage of George W. Bush in a school classroom in Florida on that famous morning. An aide walks in and updates him on the attacks (of which he was reportedly already aware) saying “A second plane has hit the World Trade Center Sir. America is under attack.” George W. Bush does nothing. The Secret Service does nothing. The “Leader of the Free World” stays in the school for another 29 minutes. Surely it would have been prudent to assume that he might be a target during these attacks. Shouldn’t he have been unceremoniously dragged out, thrown onto Air Force One and evacuated as fast as possible as soon as the FIRST plane hit? Didn’t he need to assume command of the situation? Shouldn’t the kids have been evacuated immediately just in case another plane was headed their way? Every time I say these things to people in a pub they ask the same question: “All right, what DID happen then?” I don’t know what happened and I have no theory. I am just saying the above questions are difficult for any rational person to ignore. I would certainly like to know the answers. If you go looking for answers you won’t find any. You’ll just find more questions.